Healthy foods make healthy teeth! Now that school is back in session, so begins the nightly (or early morning) ritual of packing lunches for your little surfers. Creating healthy lunches and after school snacks that your kids will actually eat can be a challenge for parents. Grabbing bags of chips and cookies is easy and convenient, but not always the best choice for healthy teeth and strong bodies. A long day at school means kiddos won’t have the opportunity to brush their teeth after lunch. All the sugar and food particles they consume will stay on their teeth, giving bacteria a chance to take hold. When bacteria has the opportunity to hang out on our teeth, the chance for cavities and decay to develop is increased. Here are a few ideas for how to keep kids bodies full and their teeth clean during the school day. A healthy, well balanced lunch means their brains will be fully-charged and ready to learn! They contain 80-98% water so in addition to tasty nutrients, they also help hydrate the body. Vegetables by nature contain more water than fruit. The top water-dense veggies are cucumbers, celery and lettuce. Carrots and broccoli are also good choices. In the fruit department, pack watermelon, grapefruit, strawberries, pears, oranges or melons. The high water content also helps rinse other sugars off the teeth, which can be a helpful tool when there is no opportunity to brush. 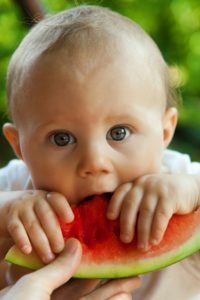 If you send whole fruits for kiddos to chomp down on the action biting into their crispy skin will also help wipe away plaque-causing bacteria from the teeth. Most kids love peanut butter and jelly, whether it’s strawberry, grape or huckleberry jam. The jelly does contain sugar (although now there are lots of low sugar and sugar-free options!) but the bread and peanut butter provide protein, B vitamins, zinc and iron. Peanut butter is also a good choice for consuming unsaturated fats. Go with a creamy peanut butter option if you can. Crunchy peanut butter can leave little nuggets of well, nuts, in your kiddo’s teeth that might trap bacteria. But, a good ole’ fashioned PB&J is a classic way to keep your little ones full. Sweet potato chips are a healthy option for a snack that packs that crunch we all crave so much. A sweet potato carries fiber and antioxidants, so they are more filling than regular potato chips and healthier. Oh yeah, sweet potatoes are also high in Vitamin C which we is key to having healthy gums.You can also try sweet potato chips as an after school snack by adding a dash of cinnamon and sugar. Now that the kids are home, they can brush their teeth straight away. Whole grain pasta is a fun item to pack in a school lunch. One benefit is that they do not need to be refrigerated, so it can also be a good way to use leftovers from the night before. Pasta is available in fun shapes and colors to make it more appealing for kids. Packed full of nutrients, whole grain pasta will keep your kiddos feeling full so they can power through the afternoon. This list wouldn’t be complete without the inclusion of dairy products. Kids love milk, cheese and yogurt. The good news is these foods are rich in calcium which is definitely good for building strong teeth! And some cheeses (cheddar, gouda, dry jack and Swiss cheese) actually help neutralize the acids found in foods that can be harmful to tooth enamel. Dessert? Yes … it’s okay. Okay, let’s be real. Cookies are amazing. And delicious. And yes, most all kids enjoy a little sweet after their lunch. There are plenty of nourishing cookie recipes available that don’t have to send your little surfers into a sugar overload. The big thing to remember is to avoid sticky ingredients that will get stuck in your child’s teeth. Oatmeal, coconut, bananas and pumpkin are tasty food stuff you can include in your recipes. Take a stroll through Pinterest or even a Google search and the possibilities are endless! Send water or a sugar-free juice drink as a beverage. The water will help rinse food particles and sugars off your little surfers teeth. Low-fat milk is another smart choice as the calcium really does do a body good. The Smile Surfers team wishes all the little surfers and their parents a healthy and fun-filled school year! Book your fall appointment with our board-certified pediatric dentists at Smile Surfers today.